Our range of products include designer canopies, window canopies, outdoor canopies, polycarbonate canopies, tensile canopies and umbrella canopies. 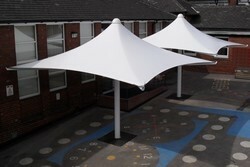 With the help of our expert workforce, we are designing and developing a sustainable range of Designer Canopies. Moreover, these products can be customized in terms of size as per the requirement of our clients at market-leading rates. 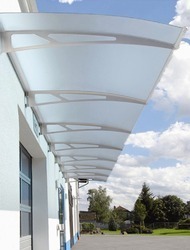 Backed by rich industry expertise, we are offering our clients a comprehensive range of Window Canopies. Our range of canopies is extensively used for protecting houses, offices, and rooms with windows from rain, heat, dust and sunlight. We are a trusted organization engaged in catering to the variegated requirements of the clientsby providing optimum quality Outdoor Canopies. These Canopies are manufactured using a the high-quality raw material, which we procure from the most trusted vendors in the industry. Moreover, products we offer are manufactured using latest technologies and tools in accordance with quality standards. 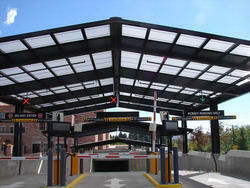 With the aid of our procuring agents, we have been able to bring quality-approved Polycarbonate Canopies. These products are highly durable and are extensively demanded and appreciated by our clients. These are available in various sizes and as per clients' specifications and requirements. Products we offer are properly examined by the team of skilled experts to ensure high quality product final output. With vast industrial knowledge, we are betrothed in presenting a large compilation of Tensile Canopies. 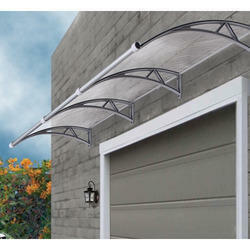 We are the leading manufacturer of Umbrella Canopies of best quality.